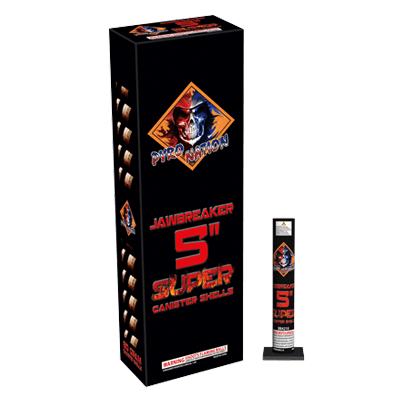 Jawbreaker 5″ Super Canister Shells – AWESOME 5″ canister shell kit. HUGE and LOUD breaks, with more color changing shells than many other 5″ kits. A must have for the serious shooter. #5 Pink Tube - Single-shot mortar tube. Image on packaging reflects the effect seen. 1" Mini Artillery Shells - Fun miniature mortar set! These mortars are only 1" in size. Perfect for smaller displays. #5 Green Tube - Single-shot mortar tube. Image on packaging reflects the effect seen. Lock & Load Artillery Shells - THEY'RE BACK! You have to see the size of these bursts to believe them! An ultimate combination of 24 totally different canisters and effects make this a must-have kit!